How did you feel the day they shot Lennon? How many times have you felt that sad for someone you didn't know personally? That was one of the few moments in my life when I shed a tear for a "total stranger". 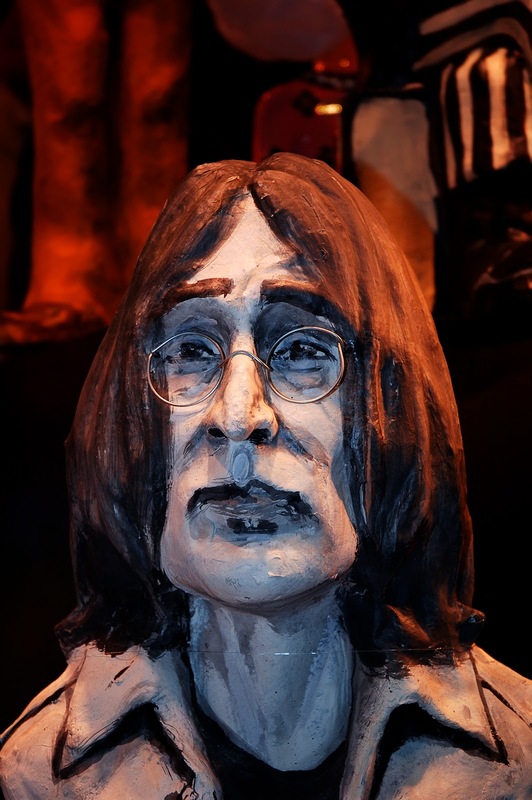 With this figure of John Lennon in papier mache I want to honor his memory. If you want to remember him for only five minutes watch the video or read the lyrics of the song below. I leave you with a final question: Why did Mark David Chapman had to kill the dove of peace? IMHO, he was programmed to kill John Lennon because TPTB wanted John out of the way because of his influence. Thank you for this and for your visit to my blog. Tinc 33 anys, 5 quan van matar en John Lennon, el curiós és que me'n recordo de la notícia a Informe Semanal i ni tan sols sabia qui era, em va copsar la imatge d'ell i La yoko sota un arbre i el rebombori de la notícia. Anys després vaig ser una fan "malaltissa" dels Beatles i em feia dir Lennon al institut...I si, he plorat molt per la mort d'algú que ja era mort quan el vaig "conèixer"...curiós.MJ. Carlos, qué post más emotivo. Yo también lloré, o por lo menos las veces que he estado viendo algún documental o escuchado alguna canción de nuestro amigo John, acabé llorando por no entender muy bien cómo funcionamos como personas. Qué pena, verdad? EL mundo es una locura, ciertamente. Y me hubiera gustado a ver vivido esa época, pero nací en el 82, no me dió tiempo! Un saludo, y gracias por el post, te ha quedado francamente bien. Oh, it was a horrible night, no? I remember crying, also. My husband and I went to NYC two years ago and walked by the place where he was shot. There are some certainly crazy things that happen, no? I believe that there was people who Lennon wasn't convenient (too much peace and love). Obviously it was a black day, but often I've been thinking about how could be his life today. Could he has believed in the sames things? and looking others persons about his age, could he has aged with dignity? I like this blog ;-)!